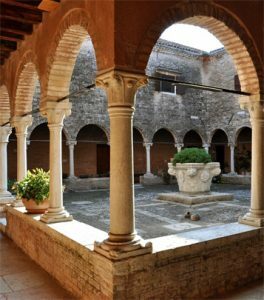 Everyone knows the three main island of Venice, Murano, Burano [link] and Torcello [link], but a few people know that there are several other visitable minor islands in the Venetian lagoon. If you are not staying in Venice for just a day [link], you should give yourself the time to discover the amazing and hidden world behind these little islands. The minor islands you must see in Venice during your vacation are, at least, five: San Lazzaro degli Armeni, Lazzaretto Nuovo and Lazzaretto Vecchio, Sant’Erasmo and San Francesco del Deserto. Did you know that Armenians used to live in Venice and trade with its inhabitants? This island, however, is not related to any trade exchanges, in fact, it has been home to the monastery of the Armenian Catholic Mekhitarist congregation since 1717. Once you get off the vaporetto, that from St. Mark’s Square takes you to San Lazzaro degli Armeni, you’ll instantly understand the beauty and the quiet of this island. Inside the church of San Lazzaro degli Armeni, there’s a library with approximately 200,000 ancient books. The island can be visited only with a guided tour at 3pm, every day. These two islands, New and Old Lazzaretto, are known because of their role in the past. In fact, they were used as a place for quarantining people and goods and prevent the city from plague. Here’s why they are named “Lazzaretto” that in Italian means leper hospital. Both of them, exactly as Venice and the whole lagoon, are UNESCO World Heritage sites. Sant’Erasmo is located on the north of Venice, next to Lazzaretto Nuovo island. It’s famous for its artichokes, called “Castraure”. You won’t find any museums here, but you can taste one of the most delicious products of the Venetian Lagoon and live a peaceful moment, far from the rest of the world. This island is inhabited by a small group of monks, belonging to the Franciscan Order. The island is a heaven on earth with its beautiful garden and monastery. You can visit it joining a boat tour and learn the history of the island, directly from one of the monks, who are living there. These are just five of the several minor islands of the Venetian lagoon, probably the most fascinating. However, these are those we sincerely recommend, to make your Venice vacation complete.